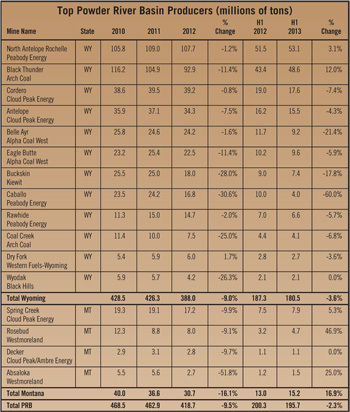 The production growth rate in the Powder River Basin (PRB) over the years has been impressive. In 2010, it hit a high point, when 16 mines produced 468.5 million tons. Then in 2011, the worries about enormous stockpiles, competition from inexpensive natural gas, and weak demand for electricity became a reality. In 2012, the region saw total production decline to 418.7 million tons. Even with that pullback, if the PRB was a country it would be ranked fourth between India and Indonesia. Production in the PRB is dominated by four publicly held companies: Peabody Energy, Arch Coal, Cloud Peak Energy and Alpha Natural Resources. All four are predicting that the market for PRB coal will improve, citing diminished stocks, slight improvements in electrical demand, and much higher prices for natural gas. 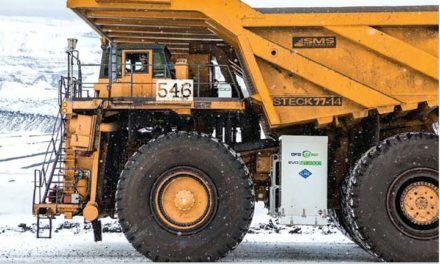 With cash operating costs hovering around $9/ton to $10/ton, all are also struggling to maintain profitability in a weak pricing environment. Currently, prices for prompt delivery (spot prices) for 8,800 Btu/lb PRB are standing at $10/ton-$11/ton for the remainder of 2013. Market analysts are predicting they may climb as high as $12/ton in 2014. Production from the PRB was down about 2.3% during the first half of 2013, compared with the first half of 2012, according to production data from the Mine Safety and Health Administration (MSHA). First half PRB production totaled 195.7 million tons, down from 200.3 million tons a year ago. Nine of the 16 mines posted production losses for the first half, with four of them greater than 20%. While these coal operators believe the market is about to change for the better, they are scrutinizing costs and delaying some capital projects until the rebound begins in earnest. Coal markets are steadily improving. Coal-fired power generation is up more than 10% for the first six months of 2013, mostly at the expense of natural gas. Coal stocks have diminished to some of the lowest levels in several years with PRB stockpiles leading the decline. All of the leading PRB operators have openly discussed how they have reduced production to accommodate the “new normal” as far as demand. Peabody Energy, the leading U.S. coal producer, believes domestic coal consumption for power generation will grow by as much as 70 million tons in 2013. Customer inventories, according to Peabody Energy, for PRB coal are approximately 25% below prior-year levels on a days-burn basis. Production at Peabody Energy’s North Antelope Rochelle mine (NARM), the largest in the PRB, remains fairly consistent. In 2012, NARM produced 107.7 million tons, a slight decrease from 109 million tons in 2011. This year, it appears the mine is on pace to produce at the same level with 53.1 million tons for the first half. The company also operates two other mines in the PRB: the Caballo and Raw Hide mines. The Raw Hide mine produces about 15 million tons per year (tpy). Production for the first half of 2013 is 6.6 million tons, which is lagging 2012 by 5.7%. Meanwhile, production at Caballo has dropped more steeply (30%) to 16.8 million tons in 2012 from 24.2 million tons in 2011. The trend continues in 2013. For the first half of 2013, Caballo’s production lags 2012 by 6 million tons or 60%. Arch Coal, the No. 2 PRB producer, is also talking about controlling costs. In its latest earnings report, the company said it sold 27.1 million tons of PRB coal at an average price of $12.56/ton in the second quarter of 2013. Operating costs were $12.02/ton. During the same period one year ago, they sold 21.8 million tons at an average price of $13.65/ton and operating costs amounted to $12.71/ton. The company has managed to hold costs down, but they are also moving more tons with a more narrow margin. Basically, they earned $14.6 million on 27 million tons in 2013 compared to $20.5 million on 21.8 million tons in 2012. Arch Coal operates the Black Thunder and Coal Creek mines, which produced 92.9 million tons and 7.5 million tons, respectively. In 2012, production at Black Thunder fell below 100 million tons for the first time since Arch Coal merged the Jacobs Ranch mine with the operation in 2009. As previously mentioned, Arch Coal is moving more volume in the PRB and that is reflected in the mid-year totals for Black Thunder, which is up 12% compared to last year. Production from Coal Creek decreased to 7.5 million tons in 2012 from 10 million tons in 2011. Overall, Arch Coal mined 100.4 million tons in the PRB in 2012, which was down from 114.9 in 2011. Arch Coal will likely produce 100 to 110 million PRB tons in 2013. Cloud Peak Energy is the No. 3 PRB producer with operations in Wyoming and Montana. They are the only coal company that can claim a “pure PRB play” status. In 2012, the company produced more than 92 million tons from four mines: Cordero, Antelope, Spring Creek and Decker (50:50 joint ownership with Ambre Energy). That figure is down about 5 million tons over 2011. Based on mid-year production figures that totaled 41.6 million tons, the company will likely post a similar decrease this year. In its latest quarterly earnings report, Could Peak said it shipped 20.1 million tons in the second quarter and that Asian exports accounted for approximately 1.2 million tons, compared to 1 million tons in the second quarter of 2012. For the full year, the company has increased its expected Asian exports to approximately 5 million tons. The company said it is focused on responding to current market conditions. It has reduced its 2013 capital expenditure budget to $60 million from $70 million. They are also evaluating reducing future 8,400 Btu/lb volumes to match market demand, optimize volumes from higher margin properties, and reduce future capital needs. Cloud Peak Energy was estimating PRB inventories at 78 million tons at the end of June, down from 98 million tons in June of 2012. The company said they were reacting to a significant increase in utility contracting during the quarter with many customers looking to rebuild their forward contracted positions after letting them decline significantly last year. So far the increased contracting has not overcome the capacity overhang created by last year’s decreased demand. They are optimistic that the steady coal burn and continued reduction in PRB inventories will lead to prices moving higher later in the year. Cloud Peak said it will deliver 92 million tons in 2013, of which 91 million tons are under fixed-price contracts with a weighted-average mine site price of $13.11/ton. Assuming constant prices of $11/ton for 8,800 Btu/lb coal and $9.50/ton for 8,400 Btu/lb coal on remaining indexed tons, the expected total realized price for 2013 would be approximately $13.06/ton. While they said they too were continuing to focus on cost controls, they also acknowledged that the combination of flat revenue and rising costs will reduce the company’s earnings. Similar to the other PRB operators, Cloud Peak Energy is trying to match production to demand and they said they are reviewing future contracting levels at all of their mines. The company will not purchase a new truck-shovel fleet for Cordero in 2014 to achieve forecasted 2015 production levels. If depressed forward markets do not improve, the company may reduce 8,400 Btu/lb shipments from Cordero by around 10 million tpy starting in 2015. 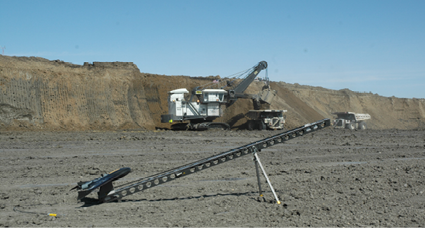 Alpha Coal West, a subsidiary of Alpha Natural resources, operates the Belle Ayr and Eagle Butte mines, which produced 24.2 and 22.5 million tons, respectively, in 2012. While Belle Ayr’s production remained fairly consistent with 2011 levels, Eagle Butte mined roughly 3 million tons less than it did in 2011. This year, the shoe is on the other foot, with Belle Ayr’s mid-year production levels lagging last year’s levels by more than 20%. In its more recent earnings statement, Alpha said it currently expects to ship 37 to 40 million tons of coal out of the PRB at an average per ton realization of $12.64/ton. The company’s 2013 adjusted cost of coal sales is expected to range between $10/ton and $10.50/ton in the West. Westmoreland Coal Co. operates two mines in Montana, Rosebud (8 million tpy) and Absaloka (2.7 million tpy). Rosebud supplies coal to the Colstrip power plant and Unit 4 at that plant experienced a major equipment failure on July 1. It will likely be down for at least 6 months. PRB operators believe they are in the early stages of a multiyear recovery as natural gas prices continue to climb. If that’s the case, then the operators could reap the dual benefits of having successfully lowered the cost structure while demand increases.